A pavement installed by the entrance to the President’s Kitchen Garden has raised the concern of some parents, who feel it is not totally safe to walk on. The pavement in St Anthony Street, Attard, was originally laid with the intention of creating a safe walkway in the busy road. However, parents lamented they could not comfortably walk on the pavement with their pushchairs, since it was at times too narrow for them to pass through. The pavement was narrowed around the trees that line the street so that they would not be cut down, consequently pushing wheelchair and pushchairs users onto the road. “It’s quite a frustrating situation,” said one mother, who preferred to remain anonymous. “A man driving down the road told me to move out of the way, but I had nowhere to go because the pavement was too narrow for the pushchair,” the young mother added. Another mother noted that there did not seem to be much else that could be done. “The pavement is definitely dangerous. Whenever I’m walking down the street, someone has to give way,” she told the Times of Malta. However, many noted there was not much else that could be done to deal with the situation. Cars have to pass through the narrow road, making widening the pavement a nearly impossible option. The Attard council insisted it had acted in accordance with the specifications of Transport Malta. 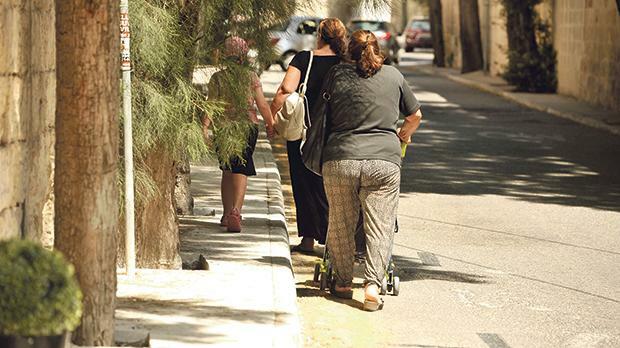 “There was no pavement before and people used to park their cars there, so some used to end up walking in the middle of the road,” a representative of the Attard council said. He admitted that the street could have been wider but the council was “constrained by the specifications of 1.2 metres given by Transport Malta”. “Unfortunately, those who are using a pushchair will have to end up in the road. Before, however, they were walking in the street the whole way,” the representative added.